to interact with a tangible object as they specify appearance properties. The setup gives designers the opportunity to view the real-time rendering of appearance properties through a virtual reality setup as they manipulate the object. Our setup uses a camera to capture the physical surroundings of the designer to create subtle but realistic reflection effects on the virtual view superimposed on the tangible object. The effects are based on the physical lighting conditions of the actual design space. We describe a user study that compares the efficacy of our method to that of a traditional 3D virtual synthetic material design system. Both subjective feedback and quantitative analysis from our study suggest that the in-situ experience provided by our setup allows the creation of higher quality material properties and supports the sense of interaction and immersion. Authors: W. Shi, Z. Wang, T. M. Sezgin, J Dorsey, H. Rushmeier. Visualization Literacy at Elementary School, B. Alper, N. Riche, F. Chevalier, J. Boy, T. M. Sezgin. Authors: O. C. Altıok, K. T. Yesilbek, T. M. Sezgin. Similarity is among the most basic concepts studied in psychology. Yet, there is no unique way of assessing similarity of two objects. 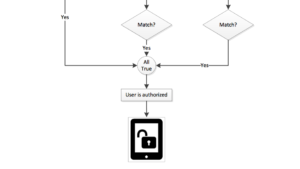 In the sketch recognition domain, many tasks such as classification, detection or clustering require measuring the level of similarity between sketches. In this paper, we propose a carefully designed experiment setup to construct a gold standard for measuring the similarity of sketches. 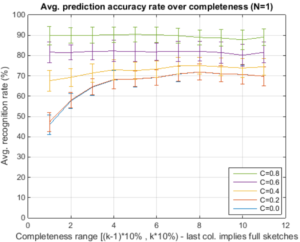 Our setup is based on table scaling, and allows efficient construction of a measure of similarity for large datasets containing hundreds of sketches in reasonable time scales. We report the results of an experiment involving a total of 9 unique assessors, and 8 groups of sketches, each containing 300 drawings. The results show high interrater agreement between the assessors, which makes the constructed gold standard trustworthy. Authors: Serike Cakmak, T. Metin Sezgin. We propose a biometric authentication system for pointer-based systems including, but not limited to, increasingly prominent pen-based mobile devices. To unlock a mobile device equipped with our biometric authentication system, all the user needs to do is manipulate a virtual object presented on the device display. The user can select among a range of familiar manipulation tasks, namely drag, connect, maximize, minimize, and scroll. These simple tasks take around 2 seconds each and do not require any prior education or training [ÇS15]. More importantly, we have discovered that each user has a characteristic way of performing these tasks. 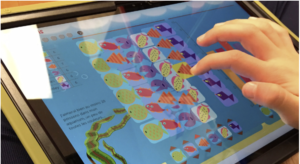 Features that express these characteristics are hidden in the user’s accompanying hand-eye coordination, gaze, and pointer behaviors. For this reason, as the user performs any selected task, we collect his/her eye gaze and pointer movement data using an eye gaze tracker and a pointer-based input device (e.g. a pen, stylus, finger, mouse, joystick etc. ), respectively. Then, we extract meaningful and distinguishing features from this ultimodal data to summarize the user’s characteristic way of performing the selected task. Finally, we authenticate the user through three layers of security: (1) user must have performed the manipulation task correctly (e.g. 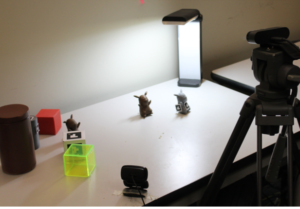 by drawing the correct pattern), (2) user’s hand-eye coordination and gaze behaviors while performing this task should confirm with his/her hand-eye coordination and gaze behavior model in the database, and (3) user’s pointer behavior while performing this task should confirm with his/her pointer behavior model in the database. Authors: Cagla Cig, T. Metin Sezgin. The IMOTION system is a content-based video search engine that provides fast and intuitive known item search in large video collections. User interaction consists mainly of sketching, which the system recognizes in real-time and makes suggestions based on both visual appearance of the sketch (what does the sketch look like in terms of colors, edge distribution, etc.) and semantic content (what object is the user sketching). The latter is enabled by a predictive sketch-based UI that identifies likely candidates for the sketched object via state-of-the-art sketch recognition techniques and offers on-screen completion suggestions. 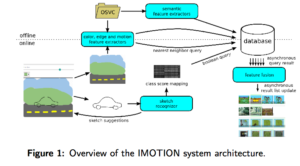 In this demo, we show how the sketch-based video retrieval of the IMOTION system is used in a collection of roughly 30,000 video shots. The system indexes collection data with over 30 visual features describing color, edge, motion, and semantic information. Resulting feature data is stored in ADAM, an efficient database system optimized for fast retrieval. 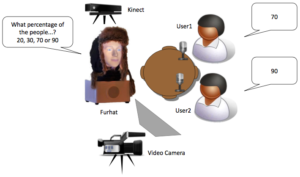 This paper presents the second version of the IMOTION system, a sketch-based video retrieval engine supporting multiple query paradigms. 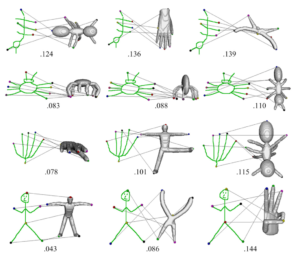 Ever since, IMOTION has supported the search for video sequences on the basis of still images, user-provided sketches, or the specification of motion via flow fields. For the second version, the functionality and the usability of the system have been improved. It now supports multiple input images (such as sketches or still frames) per query, as well as the specification of objects to be present within the target sequence. 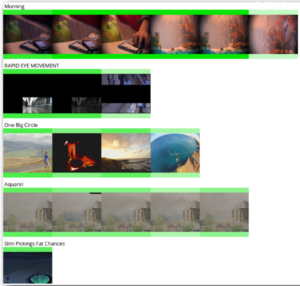 The results are either grouped by video or by sequence and the support for selective and collaborative retrieval has been improved. Special features have been added to encapsulate semantic similarity. Authors: L. Rossetto, I. Giangreco, S. Heller, C. Tanase, H. Schuldt, O. Seddati, S. Dupont. T. M. Sezgin, O. C. Altıok, Y. Sahillioglu.